Are ECs better long-term investment than condos? The Visionaire EC is a new Executive Condominium opening for sale in April 2016. This Canberra EC is likely to be popular. Firstly, Visionaire will be the 1st Smart Home EC in Singapore. It will incorporate the infrastructure now, to enable you to stay connected with, monitor, and control your home from anywhere in future, via your mobile device. See the exciting details of what to expect in a Smart Home here: Visionaire executive condo. Secondly, it is right beside the Brownstone, that has been the best-selling EC in Singapore since its launch in mid 2015. In fact, some unit types at the Brownstone are already sold out or have only limited choices left. So the launch of the Visionaire EC presents a chance for those who missed out earlier, to get an executive condominium unit within a short walk of Canberra MRT station. The Visionaire executive condo has one of the most interesting designs on the market. The site layout consists of just 2 rows of blocks strung out right across the site, with almost all the pools and facilities between them. Simple but effective. The north-facing units in the north block overlook the greenery of the old Admiralty House, that will be transformed into the Sembawang Sports & Recreation Hub. Allows good wind flow too. 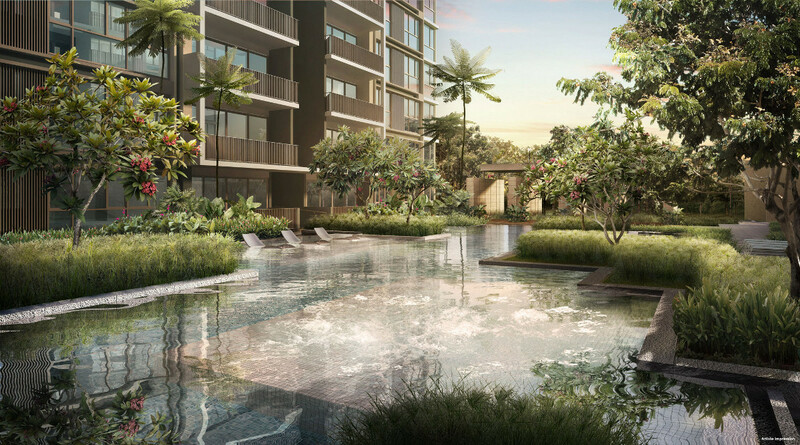 This Canberra EC itself will only be 9 to 11 storeys high, giving it a low density feel, that matches the laid back feel of its surrounding, not far from Sembawang Park and the sea. The Visionaire EC is located at the corner of Canberra Drive, Sembawang Road, and Canberra Link, about 400m, or 5 minutes walk, from the upcoming Canberra MRT station. Very few ECs are within 5 minutes walk of an MRT station. Those that are, are pretty much sold out, except for the remaining units at The Brownstone next door. For private condominiums, the price between a unit that is within 5 minutes walk of an MRT station, vs those outside walking radius, is at least 15% higher. As the Visionaire EC will be sold at pretty much the same price as other executive condos that require a feeder bus or LRT ride to an MRT point, it means that the upside potential is greater. Please register here to be kept posted as soon as details are available. Corridor lighting turns on automatically at night when someone steps out. Monitor unexpected motion when not at home, or when child opens window. Other scenarios you can set for yourself. This new Canberra EC is located between Sembawang & Yishun, within a quiet residential enclave that comprises mainly private housing. It is opposite the low-rise Canberra Residences, and close to the landed residential Sembawang Springs Estate at Jalan Sendudok. Across Canberra Link will be a new neighbourhood centre & Canberra Plaza, that will provide a food court, shops, a supermarket, child enrichment centres & childcare centres. One MRT train stop up is Sun Plaza shopping centre at Sembawang MRT station. One stop down at Yishun Central, will be North Point City, the biggest shopping mall in the North. 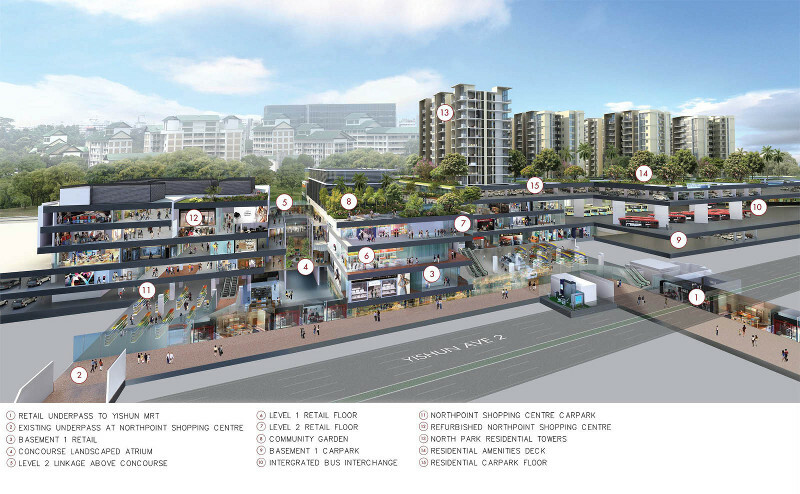 A huge integrated development with a supermarket, food courts & F&B outlets, banks, a huge range of shops, a town plaza, community club, public library, and Yishun bus interchange. The new Khoo Teck Puat Hospital & Yishun Community Hospital are also at Yishun Central. Just 2km down Sembawang Road, within easy cycling distance, is the rustic, breezy old world charm of Sembawang Park and the beach. From Canberra MRT station to Orchard Road, is about 27 minutes by train. It is a direct train ride to Raffles Place and Marina Bay. If you would like to be kept posted on all the Visionaire EC updates or register for showflat viewing, please email us here. This entry was posted in The Visionaire and tagged canberra ec, sembawang ec, the visionaire on August 28, 2018 by Reviewer. In a ground breaking move Qingjian Realty, the developer for the Visionaire executive condo, has partnered with Samsung Asia to incorporate smart technology into its developments, as and when the products become available. 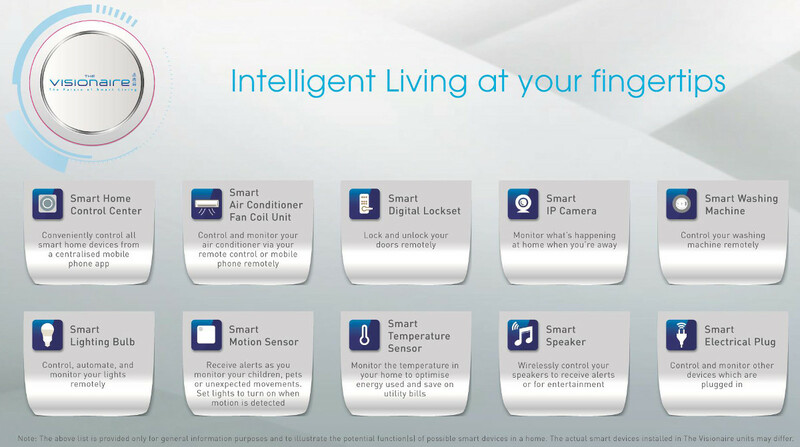 Samsung provides a Smart Home service whereby their home devices are connected. Homeowners can use this to control their home appliances remotely, such as air-conditioners, refrigerator, robot cleaner, and washing machine, through just a touch on their smartphones or gear devices, while still at the office or on the way home. Qingjian plans to offer a number of these features in its upcoming Visionaire executive condo, that will launch in April 2016. As part of the deal, buyers for this Canberra EC will also be able to buy the Samsung appliances at preferential rates. In expectation of ever advancing technology, Qingjian intends to “future-proof” its new developments by integrating into them now, the necessary infrastructure to ensure that they are smart device-ready. This will enable their home buyers to plug into a smart home immediately. Qingjian is believed to be the 1st developer in Singapore to incorporate these features into its projects on such a comprehensive scale. But it is not content with that; going forwards, it hopes to take the technology further, and to leverage on the Internet of Things (IoT) to enable even better integration of technology for their home buyers. Qingjian is arguably the biggest developer of executive condominiums in Singapore, and has launched over 5,000 residential units covering both private and executive condos. So it stands in a good position to tap technology and push new frontiers for its launches in Singapore. 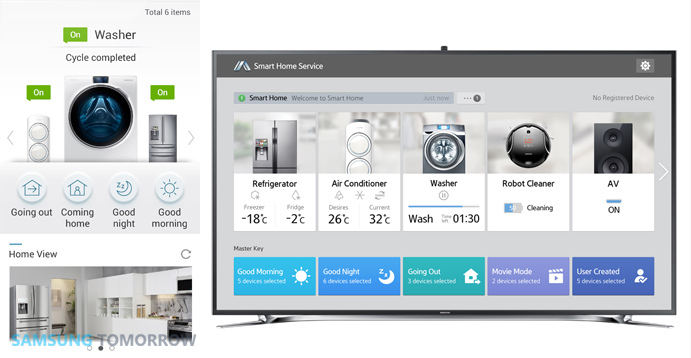 Read more about Samsung’s Smart Homes here (opens in new page). If you would like to be kept posted on all the Visionaire Executive Condo updates or register for a showflat viewing, please email us here. This entry was posted in The Visionaire and tagged the visionaire on December 17, 2015 by Reviewer. Qingjian Realty will be offering its innovative CoSpace concept in the Visionaire floor plans as well. This unique concept lets homeowners make efficient use of their space, by allowing them to customise the space according to their needs, at different stages of their lives. For example, you can convert the study and utility room into a full sized room or SOHO. Or you can tweak it into a study area for the kids, or a baby room, or storeroom with cabinets, or an entertainment or playroom, or even an extra bedroom. The COSPACE concept hinges on 3 key inter-dependent components: CoSpace Efficiency, CoSpace Flexibility and CoSpace Interactivity. CoSpace Efficiency is to maximise the space to the fullest, making every inch count. 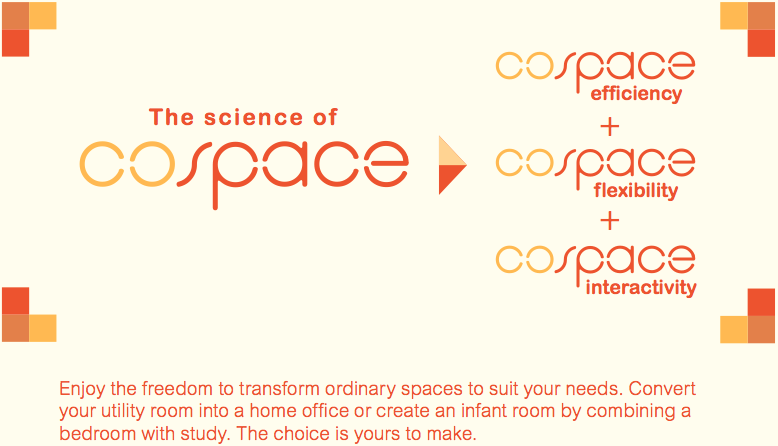 Cospace Flexibility allows you to create spaces that suit your lifestyle at each stage of your life. CoSpace Interactivity enables you to enjoy spaces that interact freely with each other. For instance, a newlywed couple could initially use the space as a home entertainment room, change it into an infant room, evolve it to become a playroom, then a study, and eventually an extra bedroom or walk-in wardrobe. Qingjian rolled out the CoSpace concept at River Isles condo, refined it at its Ecopolitan EC, fine-tuned it at Bellewoods EC, and enhanced it at Bellewaters EC. A typical CoSpace Flexi unit comes with no floor tiles, wardrobes, or doors. This could mean a cheaper unit in the initial purchase stage, making it more affordable for cash strapped buyers. And later, as they accumulate more funds, they can then spend it customising the space to their own content. If you would like to be kept posted on the Visionaire floor plans or updates, or to register for a showflat viewing, please email us here. This entry was posted in The Visionaire and tagged the visionaire on December 16, 2015 by Reviewer. The Visionaire EC is being developed by Qingjian Realty Pte Ltd, a multiple award winning developer, and one of the most experienced in executive condominium development. In fact, Qingjian Realty has the honour of being one of the top 10 developers in Singapore for 3 consecutive years. Qingjian Realty is the Singapore arm of Qingjian Group Co. Ltd, a conglomerate engaged in a wide spectrum of business operations such as real estate development, construction, logistics, capital management, and investment. The parent group’s projects include the Olympic Sailing Centre, the Liuting International Airport, and residential and commercial towers in China. Since 2008, Qingjian Realty has been involved in a number of projects in Singapore, covering commercial and industrial, as well as residential buildings. This includes private condominiums like Nin Residence in Potong Pasir, RiverSound Residence in Sengkang, River Isles in Punggol. Qingjian also happens to be one of the most prolific and experienced executive condominium developers around. It has several ECs under its belt: RiverParc Residence EC, Waterbay EC, and Ecopolitan EC in Punggol, Bellewoods EC in Woodlands, and Bellewaters EC in Sengkang, and now the Visionaire Singapore EC. Qingjian Group Co. Ltd was established in 1952, and is mainly engaged in domestic and international construction projects and investment, real estate development, logistics, capital management, design consulting, etc. It is one of the Top 500 real estate developments companies in China. Qingjian Real Estate, the property development arm of the company, has an annual output of over one million square meters, covering a wide range of building types such as large residential communities, villas & apartments, commercial & office buildings, etc. As one of the “Top 500 Chinese Enterprises” for 13 consecutive years, Qingjian ranked the 269th in 2015. It ranked among the “Top 80 Chinese Contractors” for 11 consecutive years, and among the “Biggest Worldwide 250 International Contractors” for 10 consecutive years. In 2005, Qingjian was granted the “National Quality Management Award”; it also won the first “Mayor Quality Awards for Qingdao City” in 2012. In recent years, Qingjian has garnered over 300 honors and awards at or above provincial level. It has over 20 branches all around China, including in Qingdao, Weifang, Jinan, Beijing, Liaoning, Inner Mongolia and Xinjiang. If you would like to be kept posted on all the Visionaire EC updates or register for a showflat viewing, please email us here. This entry was posted in The Visionaire and tagged new canberra ec, the visionaire, visionaire ec on December 16, 2015 by Reviewer. You don’t have to travel far from the Visionaire EC for all your needs. 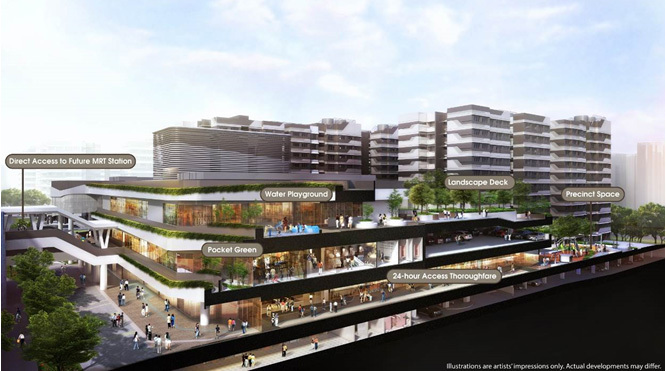 It is surrounded by hawker centres, cafes, restaurants, and shopping malls with supermarkets, banks, shops, etc. There are many schools around too, with Sembawang Primary School and Wellington Primary School both within a 1km radius, as well as the upcoming GEMS World Academy Singapore. Medical care and emergencies are well supported, with the Khoo Teck Puat Hospital & Yishun Community Hospital nearby, that will be joined by more healthcare facilities in the future. On a side note, if being within walking distance of a major shopping centre appeals to you, you might want to consider the Piermont Grand as well. This is not in Sembawang but located in Punggol, but the same principles of connectivity and convenience to amenities hold true. In the case of Piermont Grand executive condo however, it is about 11 minutes walk to Waterway Point and Punggol MRT station on the North-East line. Piermont Grand also has the advantage of water views. 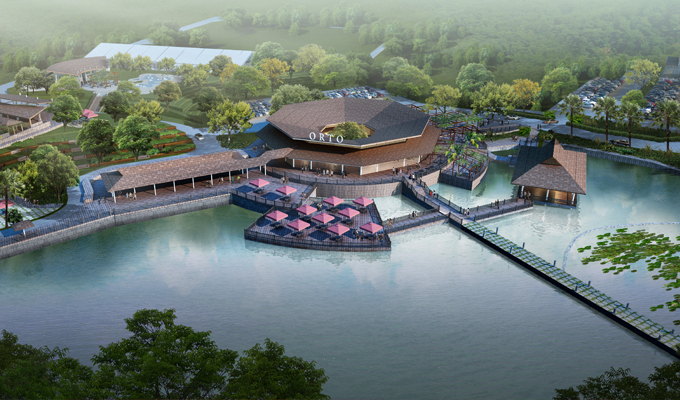 It directly fronts onto the Punggol Waterway, with pocket views to Punggol River. This project is being developed by a brand name developer, City Developments, which gives it an edge over Visionaire EC for the brand conscious. The Piermont Grand EC showflat will open for sale in mid 2019. The Visionaire executive condo is located just a 5 minute walk to the Canberra MRT station (under construction), which makes it roughly a 25-minute train ride to the CBD after it is completed in 2019. It is also connected to some of Singapore’s major highways, like the Seletar Expressway and Central Expressway. Adding to this site’s connectivity are upcoming projects like the Yishun integrated transport hub (to be completed in 2019), new roads leading directly from Yishun to the Seletar Aerospace Park, a new North-South Expressway (NSE), and a proposed Rapid Transit System (RTS) linking Woodlands to Johor Bahru. The north of Singapore is on the brink of a new burst of life. 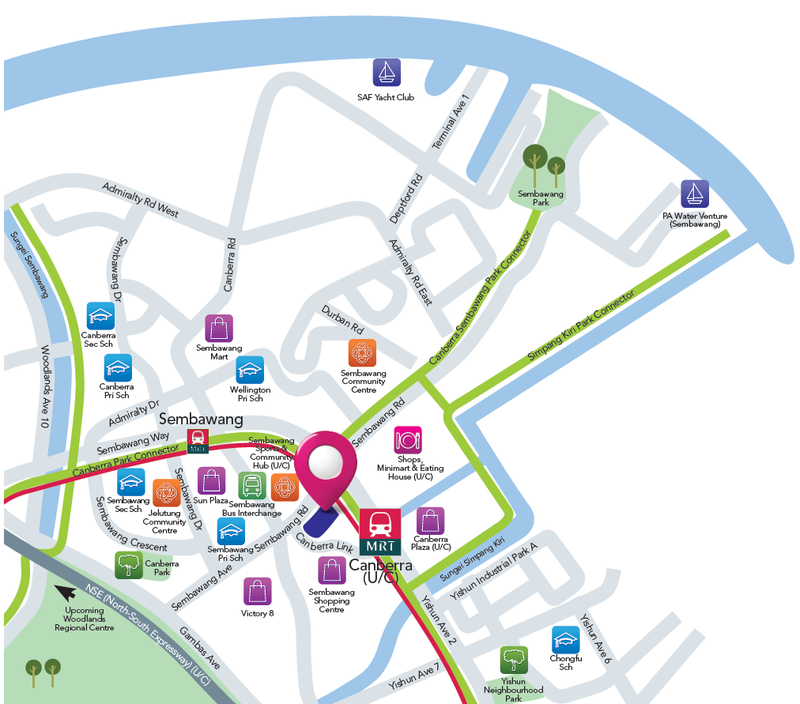 Within 10 minutes walk and close to the Sembawang Shopping Centre (click here), Jalan Legundi, once a cluster of homely eateries, is now an up-and-coming lifestyle enclave with vibrant new cafes and even a baking school. Active residents can enjoy fun-filled days (and nights) at the brand new 24-hour park Orto, that offers activities round the clock. There will be even more to look forward to in the coming years, with possible plans for an integrated wildlife park in neighbouring Mandai, and with the plans to transform the nearby Woodlands region into a vibrant commercial hub by 2017. With so much going on here, the north looks set to take off as Singapore’s next hottest neighbourhood. If you would like to be kept posted on all the Visionaire executive condo updates or register for showflat viewing, please email us here. This entry was posted in The Visionaire and tagged the visionaire, visionaire executive condominium on December 15, 2015 by Reviewer. 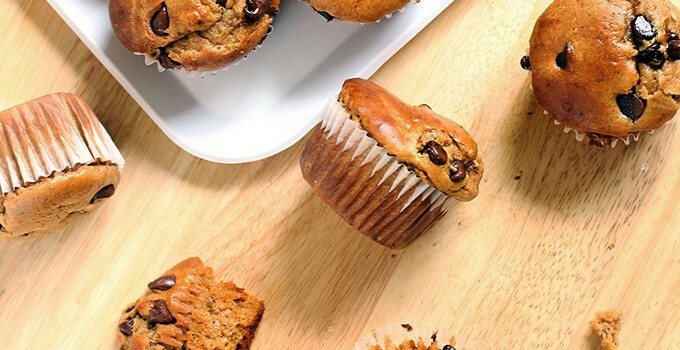 For those of us who delight in one of Singapore’s national pastimes – eating – just the thought of the foods around the Visionaire EC is enough to whet one’s appetite. Sembawang is a foodies’ haunt, home to some of the best known favourite eating places, with a mix of hawker classics juxtaposed against a growing cafe culture. One of the favourite haunts of residents. Offers a wide choice of local hawker classics. People come from all around the island for their really tasty Hakka Yong Tau Foo, so unlike that elsewhere. When you tire of hawker fare, there are lots of new cafes for a change, and even specialty ice cream parlours. Victory 8 at 8 Jalan Legundi is home to some of them. Artisanal coffee-focused cafe. Noted for its handcrafted heart-shaped macaroons, and green tea lava cake. See www.roycemarycafe.com for more. For family gatherings or get-togethers with friends & colleagues, there is a nice selection of restaurants here too. A grill and wine bar inside a private residential estate. Long time favourite of local residents. See www.flaminggmangos.com. The food joints of Sembawang can lay claim to some pretty inspired names. This entry was posted in The Visionaire and tagged the visionaire, visionaire ec, visionaire sembawang on December 12, 2015 by Reviewer.